Hello Kitty is sure to steal your heart in this CHARM IT! Hello Kitty Lock & Key charm. With a shiny Hello Kitty face representing the lock (not a working lock) complete with sparkly pink stone on her hair bow, the shiny key on this Hello Kitty charm dangles along side and features Hello Kitty's initials in beautiful pink enamel. With a simple snap of a clasp, girls can personalize their CHARM IT! jewelry with this fun CHARM IT! Hello Kitty Lock & Key charm. It's Glam Time with this sparkly CHARM IT! Hello Kitty Beauty Queen charm. It's a Happy Birthday celebration with this sparkly and colorful CHARM IT! Hello Kitty Birthday Cake charm. Hello Kitty’s sweet face puts the O in L-O-V-E in this CHARM IT! Hello Kitty Love charm. This beautiful CHARM IT! 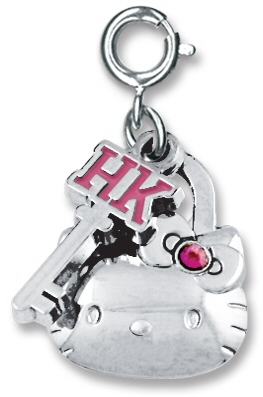 Hello Kitty Silver Screen charm has a glittery silver background and white enamel Hello Kitty.